1) The 1907 Chicago Cubs wore alternate uniforms for Game 1 of the World Series that they were forced to abandon the next day. The Cubs, en route to winning the first of their back-to-back World Series championships, opted to wear special uniforms for Game 1 of the World Series at home against the Detroit Tigers. They featured pinstripes—a World Series first—and, even more noteworthy, they were gray. For a home game. Against a road team with similarly gray uniforms. The Cubs were at work in new travel uniforms of gray. They started last year in the home uniform of white. Superstition cuts some ice with athletes and that is the reason for the switch. Clad in gray the Cubs felt they would not be at home to the Tigers, or something like that. The fact that both teams were gray suits was confusing to the majority of the spectators, some of whom never had seen a major league game before and found it difficult to distinguish the players at all times. 2) The most colorful World Series? I vote for 1979. 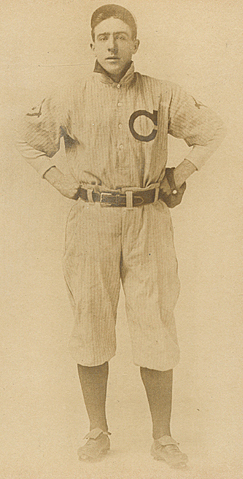 The first alternate uniforms ever worn in a World Series were those of John McGraw's black-clad New York Giants in the first game of the 1905 World Series. Most recently, the St. Louis Cardinals donned their cream-colored alternate "St. Louis" jerseys for Game 3 of the 2013 World Series. The first official logo for the World Series was created for the 1978 edition, part of a major marketing push in connection with the 75th anniversary celebration of the Fall Classic. The logo was utilized on game tickets and in the official program, and was incorporated into a range of souvenirs. The "75th" was changed to "76th" the following year and was then replaced by an entirely new logo, which was used from 1980-86. 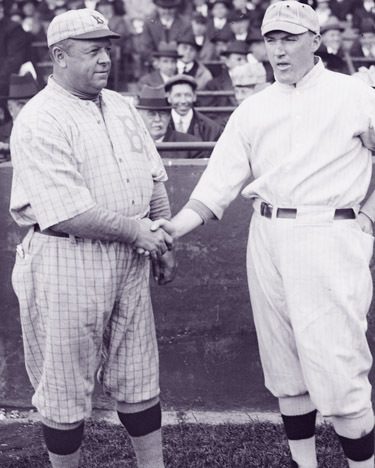 Dodgers manager Wilbert Robinson is seen at left, shaking hands with manager Bill Carrigan of the pinstriped Boston Red Sox. Stripes defeated checks, four games to one.